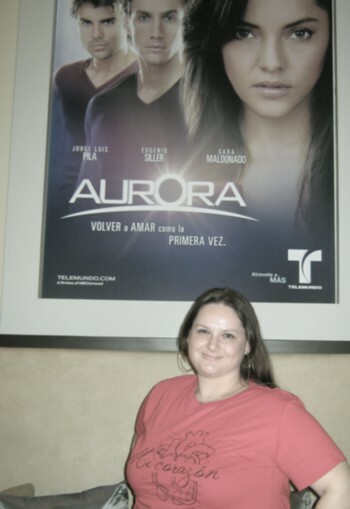 Telemundo invited us into their studios to check out where they film some of their telenovelas. So anyway, I’m posing on the set of this telenovela and I say, “Which telenovela is being filmed here again?” and they tell me, “Mi Corazón Insiste.” – Muy raro, no? Next we checked out where they keep props. It looked sort of like a well-organized thrift store. All the items on the shelves had bar codes and were catalogued – this is so they can be re-used. When they are setting up for a new telenovela they can see what they have in the catalog as far as lamps, for example, and choose one they already have, or make plans to go acquire one if they don’t already have something that fits what they’re looking for. (Wouldn’t “prop shopper” be an awesome job? )… My favorite fact I learned during the tour was that each year about 10% of the less popular props are donated to charity. Next we visited a room which I call “the editing room” because I don’t remember what it’s officially called. Here is where they… edit…video?… I think he was putting together a promo for La Reina del Sur. Last visit was to what I call the “music room” … again, because I don’t know what it’s really called. I do remember that this guy’s name is Joaquín and he is the one who adds music to the telenovelas. (Everyone say “Hello Joaquín!”) … Joaquín is also a musician, so when he can’t find exactly what he wants, he creates music on his own. Besides all this fun, Telemundo also took us to dinner. One night we went to a restaurant called “Cecconi’s” – which is much fancier than I’m used to. It was really beautiful, the waiters were attentive, the company couldn’t be beat, and (though I will seem very naca for saying this), the food was really good even if I didn’t know exactly what I was eating some of the time. Disclosure: I went to Telemundo Studios and Cecconi’s at the invitation of Telemundo. The “Mi Corazón” shirt was gifted to me by Surropa.com. All opinions are my own. Ah! You’re so lucky! Great job!! FYI: You make your readers proud chica! It is cool to see the behind the scenes and even when they were acting! Que chévere! I enjoyed your recap and the “Mi Corazón” thing was amazing!! Isn’t the “Mi Corazón” thing super crazy? I’ve been having a lot of coincidences lately. Wonder what it means. Super Chévere!!! And I love your shirt by the way! You should do this permanently Amiga! You´re great at telling las anécdotas and make them really fun. I feel like I was right there with ya giggling, tee hee!!! TE VEZ BONITA AMIGA!!! jajajaja omg y los heredos…osea helllloooo naka…why didnt you sneak in to meet them??? lol i just got addicted to la reina del sur….love the song too! jajaja… How can I sneak in to meet them? They’re filming in Colombia! Want to help me steal a plane? LOL. I’ll let you pick one of the hermanos as long as you leave Juan for me. I’ve decided FINALLY that he’s my favorite. From your mouth to God’s ears, Blanca. How super cool would that be? LOL. I don’t have any acting aspirations but I can’t imagine how much fun that would be. Hi, I’m not sure if they do regular tours for the public – I was invited as a blogger. It was a really cool experience – I hope you’re able to go some day. Best of luck!